I just recently started following another local Boston blog named Loaded Gun Boston headed up by Sam Baltrusis and it's pretty awesome. He's got great insight into the movie/filming scene in Boston. Of particular interest to me (and probably you guys) he's got the low down on the latest film locations for both The Company Men and Lake House. The Company Men is/was back in the South End this week (here) and The Lake House is going to be filming in Southborough soon (here). For the latest on the media/entertainment front in Boston, I recommend adding Loaded Gun to your RSS feed. 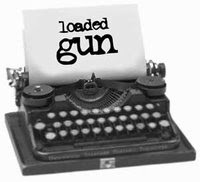 Click (here) to check out Loaded Gun for yourself. 1 Response to "Loaded Gun Boston Is Great"
Gee, thanks for the plug!